The CI871 is an AC 800M communication interface that connects to the PROFINET IO devices through Ethernet. 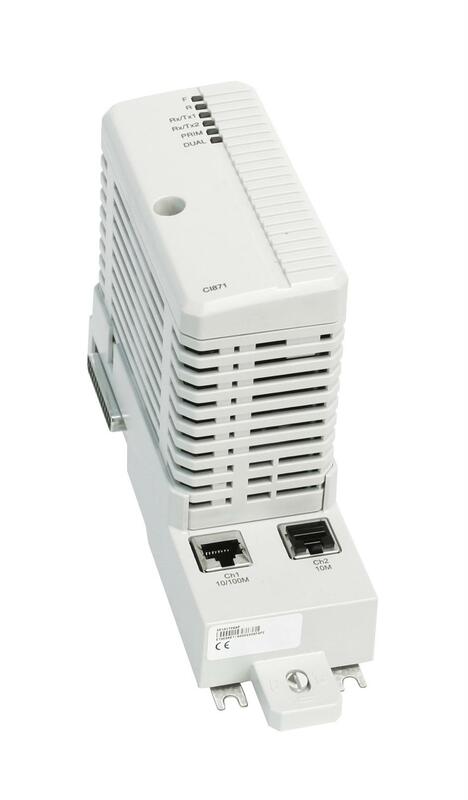 The TP867 Baseplate has two RJ45 Ethernet connectors, but only the CH1 connector that supports 100Mbps is used for PROFINET IO connection. The Ethernet cable must be connected to the PROFINET IO network through an Ethernet switch. The CI871 expansion unit contains the CEX-Bus logic, a communication unit, and a DC/DC converter that supplies the required voltage from +24 V supply through the CEX-Bus.